Am I the only one in complete and utter disbelief that it's freakin' JUNE already?! Where did 2015 go? Seriously, we're like 15 minutes from Christmas...sheesh! Since the year is speeding by, let me hurry up and get on with this post before I hit "publish" and realize it's September. Step 1: Decide that it's hot enough out to try washing and going again. Step 2: Google "wash and go tutorial for natural hair"
Step 4: Run to Target//Sally's//Ulta and spend $86.47 on leave-ins, curl primers, curl revitalizing sprays, curl defining custards, moisture butter creams, and curl puddings. Step 5: Try 16 products in 52 different combination variations, and grow increasingly irritated with each failed attempt. Step 6: Wash hair (again), pull out the "old faithful" twisting cream, and set your tried and true twist-out. Step 7: Sit around and be pissed at the $86.47 you just wasted, while waiting for your twists to dry. Step 9: Repeat step 1. Curls courtesy of the $5 wash and go! Hopefully, the product combination I'm about to share will help somebody somewhere who's a novice in the wash and go game, or perhaps a natural hair veteran who's about ready to give up on the style. As promised, all of the products I share in this post are available on the ground, fairly affordable, and work well together without white clumpy drama. I'm a long-time lover of Eden BodyWorks Coconut Shea Leave-In Conditioner, because it's not quite like the rest. Where most leave-ins are just watered down (or oddly thick) versions of a conditioner, Eden's leave-in has more of a primer/hair balm feel. It adds mega shine, cuts frizz, and intensely hydrates the hair. I apply the Eden BodyWorks Coconut Shea Leave-In to my soaking wet hair while still in the shower. I don't do too much raking, but a good amount of smoothing to really work it in and wring out the excess. You don't need another explanation for why coconut oil is dope, right? If you do, click here. Otherwise, we'll just proceed with the understanding that coconut oil is awesome, Trader Joe's is awesome, and therefore Trader Joe's virgin unrefined coconut oil is awesome. I take a few quarter sized amounts and alternate between smoothing and squeezing the oil into my hair, to seal in the leave-in. 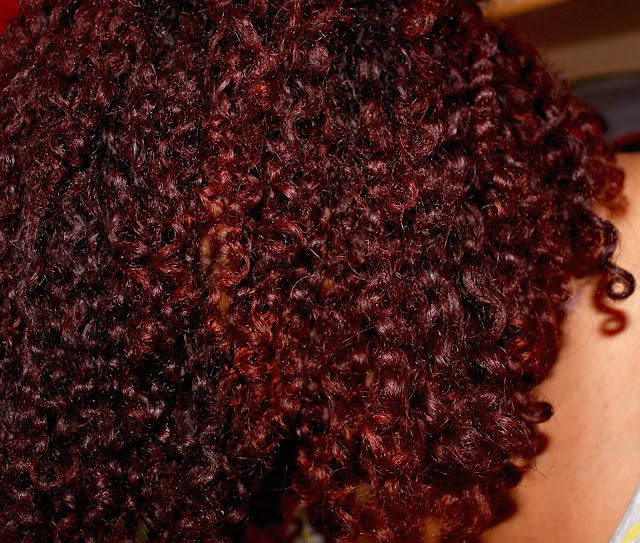 I concentrate the most on the mid-shaft through ends where my color is for extra moisture and protection from dryness. Yes, I'm still in love with Ecoco! I may try other curl definers, but I always come back. Eco Styler Argan Oil Gel delivers consistent results...when I can find a leave-in or moisturizer that meshes well with it. Fortunately, Eden BodyWorks Coconut Shea Leave-In combines well without leaving white buildup. You can apply the Eco Styler Gel generously, but don't go apenuts crazy (otherwise you'll end up with some weird gelatinous blobs...trust me). You can rake the gel through, you can smooth it, you can scrunch it -- apply the gel however you see fit. I just recommend that you apply gel all the way to the root to avoid fuzzy roots and smooth ends. At this point, feel free to seal with more oil or leave as-is. I prefer to leave it alone at this point. The Butter Cream Daily Moisturizer isn't a part of the initial wash and go setup because the combination of all 3 (leave-in + moisturizer + gel) lends itself to weird clumpage and gobs of white product buildup in the hair. But what I did discover is that tgin's Butter Cream Daily Moisturizer makes an excellent refresher/maintenance product. I rub a little bit between my palms, and smooth it through my hair in sections before bed. 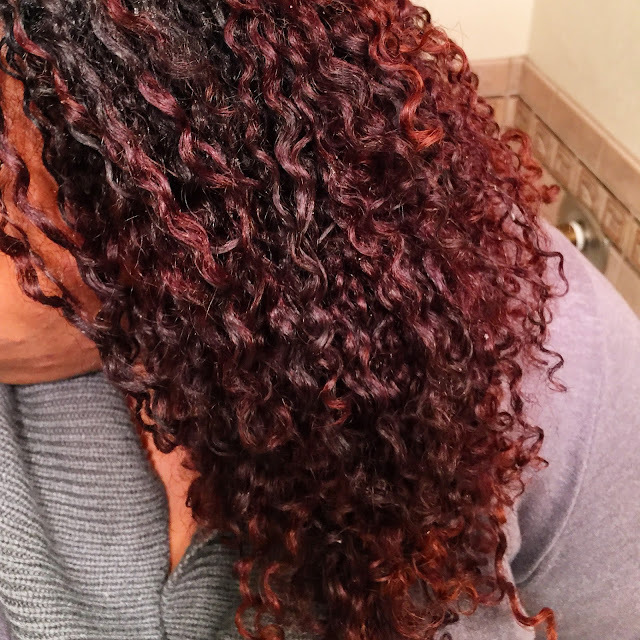 It keeps my hair soft, shiny, and helps maintain the curl definition. So where exactly does the $5 part come in? As you can see, the total cost for all the products listed hovers around $35. This factors in taxes, but also accounts for discounts due to memberships, coupons, and sales. The smallest product bottle is the Eden BodyWorks Coconut Shea Leave-In, and even if used pretty generously it will yield about 7 uses. Clearly, you'd run out of leave-in before Eco Styler or anything else. 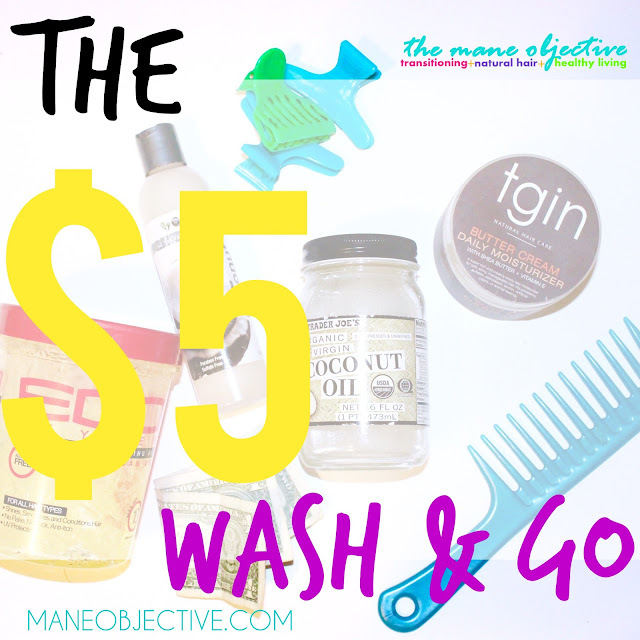 So 7 uses of $35 worth of product = $5 per wash and go. If you really want to be a super saver and mathmetician, add a second bottle of Leave-In (new total $44), but then divide that by 14 uses because you've got way more product to work with (and I hope you can get more than 14 uses out of a lifetime supply of Eco Styler). Your new total? $3.14 per wash and go. That's it, ladies! 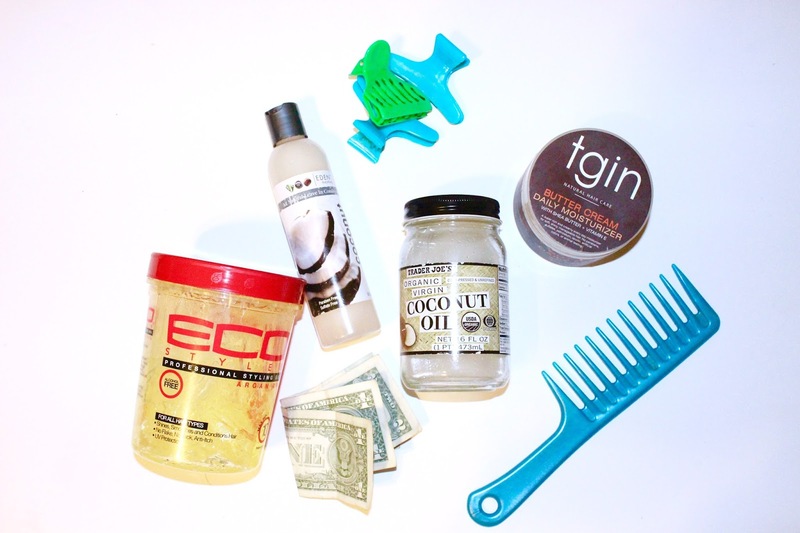 Let me know in the comments if you'll be trying the $5 wash and go! I use the pura body naturals leave in. It is not on the ground, but works great with the eco styer Argan oil and my homemade oil mix. I will have to revisit using the coconut oil to seal.